Some two weeks ago Minister in the Prime Minister's Department Datuk Seri Idris Jala said subsidies must be rationalized or Malaysia will go bankrupt by 2019 if it continues to accumulate debt at the current rate of 12 per cent a year. He said at RM362 billion it was indeed possible for such a scenario, and recommendations were put forward to increase prices of subsidised items such as fuel, gas, food and toll. Idris, the chief executive officer of the Performance Management and Delivery Unit in the PM's Departmen said, the subsidy bill was not sustainable, especially in light of the rising budget deficit and government debt (as a percentage of GDP), higher than Indonesia at 28 per cent and getting closer to the Philippines at 62 per cent. 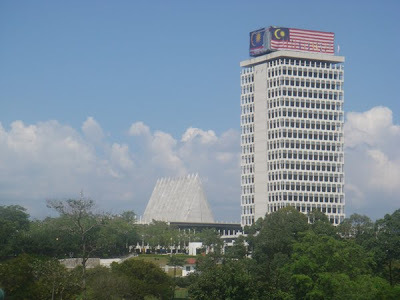 Deputy Finance Minister Dr Awang Adek Hussein denied however and said that Malaysia will NOT go bankrupt in 2019 even if a subsidy totalling RM74bil a year is continued. While you might (choice of word to soften the blow) end up paying a lot more for everything (and tightening our belts beyond belief) - just to save the country from 'going bankrupt', here's what's going on. 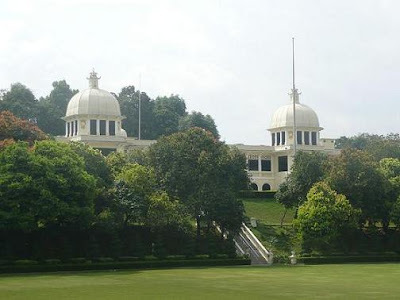 The Istana Negara, a symbol of our country's monarchy - will now cost double the RM400 million estimated. So that's RM800 million (kalao ada yang tak reti darab dua). Read HERE, HERE and HERE to read up about the fabulous structure that is being constructed that will look like below when completed. If that's not enough... an extremely smart person suggested we needed to move our iconic Parliament - to Putrajaya. At the cost of RM800 million. Click HERE to read more on it, an analysis HERE and some very smart reasons HERE. Yes, let's do our part for our country and pay more for everything to avoid our country for going bankrupt! Essentials naik harga, so what? We have two very extremely fabulous structures, right at the end of the day. Awesome! So...what can we, "rakyat" do? wonder if I choose other politicians, will they really help us or they just going to forget about us. well guys. i suppose the best answer to what we can do is show it ketika PILIHANRAYA UMUM. tu yang tanggungjawab kita mendaftar, dan mengundi.